I was able to build this ramp because a skatepark near me closed down and asked if they could store the wood in Barn #3. I took two 8' quarterpipes and put them together in the other barn. 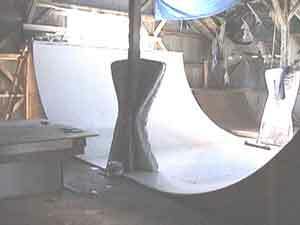 I made a free geocities website to put pictures of the halfpipe, as well as the following plans. These plans are not very good. They are the first plans that I created and I have not edited them since 1999. I would not recommend building an 8' halfpipe this way, it is overly complicated. To see a better way to make a ramp this big check out this project page. 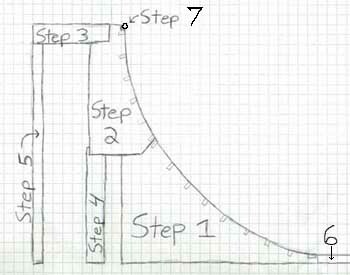 I've decided to keep the plans online, since there are not a lot of step by step instructions out there for building a vert ramp. Unfortunately I cannot improve the plans without building a new vert ramp. Someday I will do this, but not for a while. 172 pieces of 8' 2X4. 24 pieces of 8' 2X6. 24 pieces of (3/4) inch plywood. 32 pieces of (3/8) inch plywood. 16 pieces of (1/8) inch massonite.